[pwgt,pbuy,psell] = estimateMaxSharpeRatio(obj) estimates efficient portfolio to maximize Sharpe ratio for Portfolio object. For details on the workflow, see Portfolio Object Workflow. [pwgt,pbuy,psell] = estimateMaxSharpeRatio(___,Name,Value) adds optional name-value pair arguments. Estimate the efficient portfolio that maximizes the Sharpe ratio. The estimateMaxSharpeRatio function maximizes the Sharpe ratio among portfolios on the efficient frontier. This example uses the default 'direct' method to estimate the maximum Sharpe ratio. For more information on the 'direct' method, see Algorithms. Estimate the efficient portfolio that maximizes the Sharpe ratio. The estimateMaxSharpeRatio function maximizes the Sharpe ratio among portfolios on the efficient frontier. This example uses the 'direct' method for a Portfolio object (p) that does not specify a tracking error and only uses linear constraints. The setSolver function is used to control the SolverType and SolverOptions. In this case, the SolverType is quadprog. For more information on the 'direct' method, see Algorithms. Estimate the efficient portfolio that maximizes the Sharpe ratio. The estimateMaxSharpeRatio function maximizes the Sharpe ratio among portfolios on the efficient frontier. This example uses the 'direct' method for a Portfolio object (p) that specifies a tracking error uses nonlinear constraints. The setSolver function is used to control the SolverType and SolverOptions. In this case fmincon is the SolverType. The estimateMaxSharpeRatio function maximizes the Sharpe ratio among portfolios on the efficient frontier. 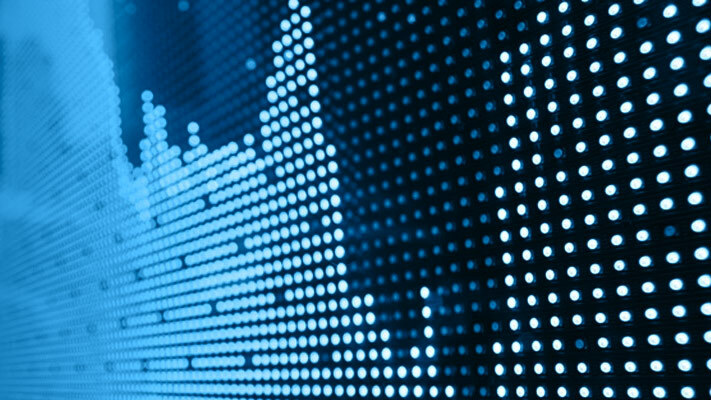 In the case of Portfolio with a risk-free asset, there are multiple efficient portfolios that maximize the Sharpe ratio on the capital asset line. Because of the nature of 'direct' and 'iterative' methods, the portfolio weights (pwgts) output from each of these methods might be different, but the Sharpe ratio is the same. This example demonstrates the scenario where the pwgts are different and the Sharpe ratio is the same. Plot the efficient frontier with a tangent line (0 to 1 cash). 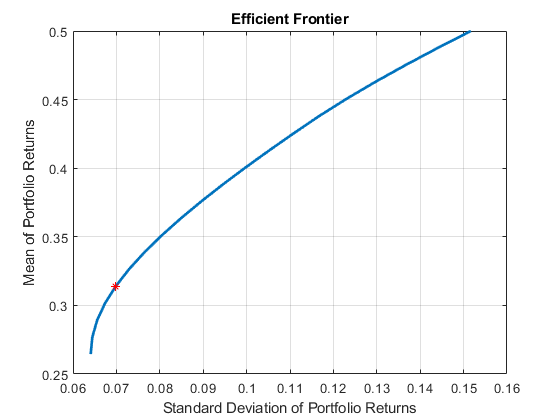 When a risk-free asset is not available to the portfolio, or in other words, the portfolio is fully invested, the efficient frontier is curved, corresponding to the red line in the above figure. Therefore, there is a unique (risk, return) point that maximizes the Sharpe ratio, which the 'iterative' and 'direct' methods will both find. If the portfolio is allowed to invest in a risk-free asset, part of the red efficient frontier line is replaced by the capital allocation line, resulting in the efficient frontier of a portfolio with a risk-free investment (blue line). All the (risk, return) points on the straight blue line share the same Sharpe ratio. Also, it is likely that the 'iterative' and 'direct' methods end up with different points, therefore there are different portfolio allocations. When working with a Portfolio object, the setMinMaxNumAssets function enables you to set up cardinality constraints for a long-only portfolio. This sets the cardinality constraints for the Portfolio object, where the total number of allocated assets satisfying the nonzero semi-continuous constraints are between MinNumAssets and MaxNumAssets. By setting MinNumAssets = MaxNumAssets = 2, only two of the three assets are invested in the portfolio. Use estimateMaxSharpeRatio to estimate efficient portfolio to maximize Sharpe ratio. The estimateMaxSharpeRatio function uses the MINLP solver to solve this problem. Use the setSolverMINLP function to configure the SolverType and options. The risk-free rate is obtained from the property RiskFreeRate in the Portfolio object. If you leave the RiskFreeRate unset, it is assumed to be 0. If the max return of portfolio is less than the RiskFreeRate, the solution is set as pwgt at max return and the resulting Sharpe ratio will be negative. 'direct' — Transform the Sharpe ratio function into a quadratic one and solve one optimization problem directly, instead of iteratively exploring the efficient frontier. The 'direct' option either uses the solver quadprog (for a problem with linear constraints) or fmincon (for a problem with nonlinear constraints). For an example of using the 'direct' option, see Estimate Efficient Portfolio that Maximizes the Sharpe Ratio for a Portfolio Object Using Solver Options with the Direct Methodand Estimate Efficient Portfolio that Maximizes the Sharpe Ratio for a Portfolio Object With Tracking Error Using the Direct Method and Solver Options. 'iterative' — One-dimensional optimization using fminbnd to find the portfolio that maximizes the Sharpe ratio by iteratively exploring the efficient frontier. If you are using estimateMaxSharpeRatio with a Portfolio object with semicontinuous and cardinality constraints specified by setBounds and setMinMaxNumAssets, you can only use the 'iterative' method. 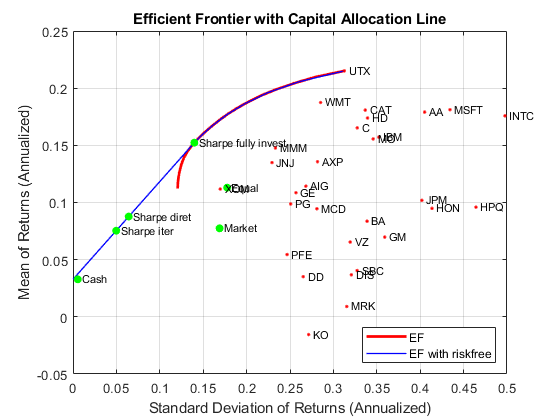 Portfolio on the efficient frontier with a maximum Sharpe ratio, returned as a NumAssets vector. Purchases relative to an initial portfolio for a portfolio on the efficient frontier with a maximum Sharpe ratio, returned as a NumAssets vector. pbuy is returned for a Portfolio input object (obj). Sales relative to an initial portfolio for a portfolio on the efficient frontier with maximum Sharpe ratio, returned as a NumAssets vector. psell is returned for a Portfolio input object (obj). The Sharpe ratio is the ratio of the difference between the mean of portfolio returns and the risk-free rate divided by the standard deviation of portfolio returns. The estimateMaxSharpeRation function maximizes the Sharpe ratio among portfolios on the efficient frontier. You can also use dot notation to estimate an efficient portfolio that maximizes the Sharpe ratio. where μ and C are the mean and covariance matrix, and rf is the risk-free rate. If μT x - rf ≤ 0 for all x the portfolio that maximizes the Sharpe ratio is the one with maximum return. Minimize yTCy, s.t. ∑yi=t, t>0, 0≤yi≤t , μTy−rft=1. Only one optimization needs to be solved, hence the name “direct”. The portfolio weights can be recovered by x* = y* / t*. For the 'iterative' method, the idea is to iteratively explore the portfolios at different return levels on the efficient frontier and locate the one with maximum Sharpe ratio. Therefore, multiple optimization problems are solved during the process, instead of only one in the 'direct' method. Consequently, the 'iterative' method is slow compared to 'direct' method. Cornuejols, G. and Reha Tütüncü. Optimization Methods in Finance. Cambridge University Press, 2007.